The wait is finally over. You’ve been asking for it for months and we are finally ready to ship it. We’re breaking down the barriers between you and your audience. When someone reads an article on your site and wants to comment, they can now use one of their existing social networking accounts to post a comment. No longer do they need to create yet another account and profile. Since it is a large change, we are making Jetpack Comments opt-in. To activate it, just visit the Jetpack menu on your Dashboard and click the Activate button inside the Jetpack Comments box. To leave a comment, just click in the box and start typing. You can also change the “Leave a Reply” heading and the color scheme of the Jetpack Comments form under the Settings → Discussion menu. Multiple fixes for Sharing, such as updates for language locales on the Facebook Like button and making the More button more reliable. Updates to the YouTube and Audio shortcodes for better URL escaping. Update the YouTube shortcode to respect the embed settings in Settings → Media when appropriate. Code clean up for After the Deadline. You should see the update available in your WordPress dashboard shortly. Alternatively, you can always download the latest version of Jetpack here at jetpack.me as well. Remember to contact support if you need help. Increased customizability of the Subscription feature’s emails. A better Jetpack management interface. A refresh of the Sharing options. ¹ Guest commenting is still controlled by the options in Settings → Discussion; if you disable guest commenting, visitors will not be able to use this option in Jetpack Comments. This entry was posted in Features, Releases. Bookmark the permalink. It may take a few minutes to appear in your Dashboard. Please check back in a few minutes. Awesome, will try out this soon! Do I need to update Jetpack to get this feature? It is not showing up on my Jetpack dashboard and I don’t have any plugin updates pending. Awesome… will try out this soon! Nice! And I’m assuming it comes with the trusted Akismet spam protection as well? If you subscribe to Akismet, then yes, your comments will get run through the Akismet spam check. Jetpack Comments provides the social networking login options. I’m not seeing this option when I go to the JetPack menu item. Do I need to force a re-download of the plugin using version 1.4? Mike, it may take a bit to appear in your Dashboard. Please check back for the update. Gregory, we are investigating methods to do imports to Jetpack Subscriptions; we want to make sure we do it right for both you, the site owner, and your subscribers, so that neither of you are subjected to spammers. Please consider using the other features Jetpack offers; there’s some awesome stuff in there. Strange issue and it may just be a fluke but shortly after this post went up, I went to a few of my sites to see the new comment options in jetpack and I did not see them yet but I did notice that all the WP sites I have with jetpack are currently slow to at a stop. This is across three different hosts so I started wondering if the update may be causing this? Could be a long shot and unrelated but really strange timing. The Jetpack Comments feature is opt-in. Did you go to the Jetpack menu and click Activate on the Jetpack Comments card to activate the new feature? ok – things seem to be back to normal now and all the sites that are responding have a jetpack update notification. Still seems like strange timing if it is not related but wanted to check to make sure and bring it to your attention if it is. Looking forward to testing the comments feature! Is this compatible with the new WP 3.4? Right now it is appearing in an iframe for me. Is that to be expected, and is there any hope of that changing? I’m asking because the “Leave a Reply” text ends up quite jarring against the rest of my theme and I don’t really see any options to fix it. The iFrame is expected and there are no plans to change it in the near future. There are some options to change between a light, dark, or transparent color scheme and an option to change the “Leave a Reply” text in the Settings -> Discussion menu. Ho do I deactivate this option from my site? Couldn’t find a way to do it – once activated it grabs control of all the commenting system. Could you tell me what I should change in my theme to make this work? I’ve activated this, but my theme is still showing the old comments options. Did you go to the Jetpack menu and click on Activate on the Jetpack Comments module? You may also need to clear any cache plugin you have installed. Does your theme use the comment_form() function (reference)? Did you activate the new feature? Go to the Jetpack menu, then click Activate in the Jetpack Comments box. Yes, it’s active. I also purged my WP Super Cache and Cloudflare caches. Still showing original/old comments. If you (temporarily) switch your theme, does the new comment form show? Same here, not getting any new comment on my theme, and on twenty eleven it works… What should we do? Does your theme use the comment_form() function (reference)? If it doesn’t, then Jetpack Comments doesn’t have a way embed itself in place of the default comment form. No idea. But other comment system like Disqus have worked in the past. Hm. Thanks Tim. I was able to fix my theme by updating the comment_form reference. cheers! It looks like some themes are overriding the form. If you do a preview of it in 2010 or 2011 you will see that the updated jetpack form is there. Works when I switch to 2011, but not with my current theme. Any idea what I need to change in my theme template to ensure that Jetpack Comments will override the theme? Sad not to see Google included here, is that on the horizon too? No current plans for this, though we’ll add it to the list for a future update. Thanks! I’ll second that request. I’d like to see support for Google. First: Thanks alot for listening to the users and finally releasing this feature. Great job! Alas, the actual feature isn’t good enough. At least not for me. And it’s not what I expected. It takes a couple of seconds (at the LEAST) for it to load whenever someone tries to post a comment. And also, when the comment is posted, the user is directed to jetpack.wordpress.com, or at least something from there is loaded. I want my comments to be integrated ONLY on my blog (when I’m not using “post as wordpress account” ofcourse). So I’m afraid I won’t be using this. Thanks for the feedback. I understand the concern. In order for us to provide social networking logins, we need to authenticate the logins. To authenticate those logins, we need to talk to the social networking service’s API’s. Those require oAuth keys. If we had released Jetpack Comments fully embedded on your site, you would have had to go to each service and obtained your own oAuth keys. If we then add another social network service in a future update, you’d have to go get another oAuth key from another provider. Needless to say, for a lot of folks, this is overly complicated. We simplified it by posting comments through our service so that we can use our oAuth keys. It reduces the amount of work needed to get this module working and to give people the ability to use social networking logins on their sites. This is also used by some more advanced users, and theme developers. It would be good to get an option to use it directly from our sites without iFrame and with our oAuth keys. Bojan Cincur, we’re working on ways to customize (either manually or automatically) the comment form, but the form will probably always live in an iframe. I just don’t get it, what is it that the comments needs to load from the server? I’ve only tested with myself manually typing in name, mail and website. Still it has to load from jetpack.wordpress.com. If I want that kind of comment feature I’d switched to disqus a long time ago. The comment is posted to your site, but it goes through jetpack.wordpress.com first so that we can verify the identity of the person posting the comment. We’re always conscious of performance and creating a good user experience, so your opinion of Jetpack Comments may change (for better or worse :)) as we improve Jetpack. Could you also make it go over https (in the includes on jetback domain) if the blog is run over https? We’re sorry, but we could not fulfill your request for /wp-comments-post.php on this server. You do not have permission to access this server. Data may not be posted from offsite forms. Any ideas how I could fix this? Hi Zoë. I was having the exact same problem so I disabled the “Bad Behaviour” plugin as you suggested and it worked. Yey! Thanks. The plugin ‘ZigTrap’ is also probably doing the same thing like Bad Behavior, because Jetpack Comments started to work for me after I disabled it. it wasn’t using but hard coded commenting solution. I just replaced replying part of code in comments.php with and now it works. On chrome & firefox I also am not able to authenticate via twitter, facebook or wordpress (endlessly loading “connecting to “). On safari it works fine, so I’m guessing it’s due to the option “disable third party cookies”, which is enabled in most browsers these days by default. Any solution for this? Currently, because of the way we authenticate social networking logins, you need to enable third party cookies or make an exception for the WordPress.com domain. When we tested Chrome, Safari, and Firefox, we found that, by default, third party cookies were enabled. AHHH! I am so excited! HUZZAH! I could kiss you guys! Thanks for letting us know; we’re working on a fix for this now. If anyone have problem with new Jetpack Comments not showing up, I wrote small guide how to fix this problem in your theme! you my friend are awesome, fixed my problem pretty fast. The Jetpack plugin sees another update, and now include Jetpack comments! Once activated, the new comment form includes the option to log in with your WordPress.com account, Twitter, or Facebook. 1. Product reviews/comments submitted with WP Recaptcha plugin active never show up (ReCaptcha doesn’t show either – integrating the two would be useful for users who don’t want to login with FB, WP, Twitter accounts). 2. Jetpack comment box does not appear in the blog comments section, only in the WooCommerce product review/comments section (with or without WP ReCaptcha active). With the Jetpack comment form you also loose the WooCommerce form functionality to rate products. PS: Curious to know if there’s plans to include Google login at some stage too! It’s awesome you’ve let this happen so quickly just after the last big update with contact forms. But also I’ve got some problems. 1) I’ve got a custom made template and the comment form is placed in a normal div. But the iframe always has the height of 315 pixel which takes up a lot of space below that jetpack form. It doesn’t look good. Isn’t there a way to make the height smaller and then strech out if a comment is written? Or am I the only one having this problem? 2) Also if I try to post a comment there’s this error message: “Invalid security token”. I’ve logged out to see if the problem still exists if guests are posting and it is. Any idea what’s causing that problem? So there’s no way for me using it right now. 3) The last one, a smaller one, but still: I’ve been able to add a margin to the iframe, but isn’t there a way to change my css and overwrite the style of the heading? Didn’t work, so I figured I’ll just aks. Because the normal font of the heading doesn’t fit in with my template style one bit. Points 2 and 3 might be related: could you remove your customization and see if the error message goes away? 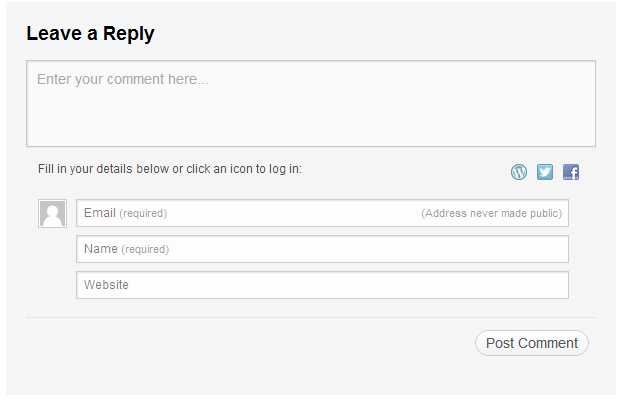 We currently are not supporting customizations of the comment form beyond the Settings -> Discussion options. It doesn’t change anything, it still won’t work. It does not works on my blog, I think because of my template… how can I resolve? You may need to add the comment_form() function to your theme or contact your theme author and ask them to update to using it. I’ve seen this on other sites and love using it. How long after upgrading to 3.4 should it show up on my Jetpack page? Thanks! You can visit your WordPress Dashboard, go to the Plugins menu, then click on Add New. In the Search box, type in Jetpack, then click install. It should run through a few things and then the Jetpack plugin will be installed for you. The new Jetpack Comments is very slick. Glad you guys fixed the embedded media sizing issue too. The bigger problem is that we were originally considering Jetpack Comments in order to limit commenting to people who authenticate with Twitter or Facebook, to somewhat discourage undesirable commenting behaviors by forcing people to use their social media profiles (or go through the hassle of creating a fake one if they’re that persistent). However, it doesn’t seem like there is a way to disable anonymous commenting or the guest commenting option unlike in wp.com (http://en.blog.wordpress.com/2011/06/07/post-comments-twitter-facebook/comment-page-2/#comment-130403). We tried checkmarking the “users must registered and logged in to comment” discussion setting but that just replaces the commenting form entirely with “You must log in to post a comment.” and replaces “Reply” with “Log in to reply”. Clicking on that just brings users to the wp-login.php page. We were hoping it would leave the comment form with the WP/Twitter/Facebook authentication options but without the email/name/website fields so people can still log in through those services and would have to before they could post/submit their comment. We don’t currently want people to register user accounts on our blog itself. Are we overlooking anything here or is our assessment of what Jetpack Comments is capable of correct? Is there a way to disable guest commenting while retaining WP/Twitter/Facebook authentication? Again, while it may not meet our needs, its a great addition to Jetpack. Just wanted to share our questions to double-check we’re not using it wrong as well as our positive feedback. We are currently looking at the guest commenting setting. We don’t have any control over who blocks our services. In order to use WordPress.com, Twitter, or Facebook accounts, users will need to be able to access jetpack.wordpress.com. I have the same concern as “chinaSMACK”. I don’t need to allow guest or anonymous commenting. Just those who signed in using the services. Thanks for looking into it! If I activate Jetpack Comments and don’t like it is it possible to de-activate it? Yes it is. Just go back to the Jetpack menu, click on Learn More in the Jetpack Comments box, and click Deactivate. If you’d like to tell us why you don’t like Jetpack Comments, we’d appreciate it. Will you add a highlight to author comments? I agree, that highlighting authors would be good. Would also be good to highlight registered users. I do that on many of my blogs where the only people registered on the site are authors and I’d like them highlighted as such. This would be fine if I had to list the authors, author IDs or author emails in order to identify who should be highlighted. Also, I haven’t played with this completely, but on all the sites I’ve seen it it defaults to my WordPress.com profile login if I’m logged in (which I always am). Is there a way I can have it default to something other WordPress.com? For example, on some sites I want the default form, and on others I might want Facebook to be the default. If you are logged in to your self-hosted site, it should default to that login. If you aren’t logged in locally, we look for a WordPress.com login. Otherwise, the form gives the login options. There aren’t any options for this currently. I figured that was the case. I’d love an option to be able to choose the order that it looks. I don’t want WordPress.com login to be the default. Thanks! Very cool feature! My WP theme offered only a rather poor reply box. Perfect substitution! One important thing to note: Besides using comment_form() – as already mentioned – one must not enable Solve Media for comments, otherwise any submitted comments will be refused. Plugins > Solve Media > [ ] Enable Solve Media puzzles for comments. … in case someone uses Solve Media and its corresponding WP plugin. Still the Jetpack Comments is not showing. Any ideas? If you could send your site URL that would be very helpful. Thanks! Strange, it should work on tweenty ten and eleven without any modifications. Are you sure that you enabled them in jetpack, and plese make sure no other comment systems are installed. If you need more help just contact me. Did it work on twenty ten or eleven? Yes, it doesn’t work on Twenty Ten or Twenty Eleven. I used to have Livefyre installed, but I’ve deactivated it. Do I need to uninstall it as well? Awesome! I have waited so long for this! Nice. It works perfectly on my side. First of all, thanks for this much awaited feature in Jetpack. I had to make changes in my theme to be able to use the comments form. Now I’m facing another issue. The jetpack is not showing existing comments at all. It is only showing the comment box. Could you send us your URL and an example post that this is happening on? Send the info through this form and we will get back to you ASAP. Jetpack is not dysplaying your comments, that is done by your theme… Retrace your steps, you need to replace just form from the theme, you probably removed part that was displaying comments too. Testing it on my site right now, but why can’t readers sign in to LinkedIn and leave comments? That would greatly benefit business sites. Facebook and Twitter are the more popular services at this point, so were our choices for a starting point. We may look at adding other services in the future. Slow down, cowboy! Speed kills. This sounds like it may be a plugin compatibility issue. Try deactivating your other plugins and then trying Jetpack Comments. While I wholeheartedly welcome the feature, I have to chime in with other commenters – having the form (and data processing) go through wordpress.com makes this feature a no-go for me. Apart from the fact that I don’t like “forcing” my users to accept that their data is being transmitted to wordpress.com servers (which in some countries would require truckloads of data privacy agreement addendums), the loading times outside the US are less then stellar (compared to the quick loading times of my blog itself) and even though it tries to mimic the look & fell of my blog as good as it can, it completely ignores the custom webfont I’m using. So for now, it’s definately a great feature for less technically savvy blog owners out there, but for me it lacks advanced features (e.g. using my own Facebook App ID or Twitter Site ID) so that oAuth doesn’t have to go through wordpress.com. As I pointed out, there may be plugins too that hinder comments to be submitted and processed. Are there any suspicious plugins in use, in your case? Very nice, but is there a plan to integrate these comments with self-hosted WordPress accounts instead of .com accounts? Sorry, but I want to control the user base. If a user is logged in locally, then their local user account will be used when maxing a comment. Also, currently, if guest commenting is disabled, users will be presented with a login link to the local self-hosted site (this may change). This is a hugely positive step in the right direction, for which I commend you. However, that said, I feel it requires more extensive ID options, e.g. Google+, OpenID, Disqus etc., plus the option to tweet/Facebook wall/G+ your comment. I hope that this functionality will be added (and that WordPress in general becomes far more socially integrated). Until then I’ll continue to use Disqus on my blog as it offers users far more options. That’s what I’m thinking — any reason to choose this over implementing Disqus on my blogs? This is a first iteration. We’ll be looking at adding new options over time. We appreciate the feedback! It took me a while to get it working with Kubrick, but it’s a great feature! I’ve got a follow-up question, however, is it possible to change the account to comment? I’m always logged in to my blog, but I would like to post comments with my FB account. As far as I noticed to do so I have to log off my blog and then choose commenting with FB. Can I change it somehow? Or maybe there is an option I didn’t see? You have found the method: if you are logged in to your site, the form defaults to that account. You need to log out to change accounts. Looks nice and easy to use and good to see the integration with social medis. Twitter and facebook integration is pretty much all that lots of people use so you’ve started with the right ID options. Could you contact us through our support form and let us know what theme and other plugins you are using? You should also try disabling all other plugins and changing to the Twenty Eleven theme to see if that fixes the issue. Thanks! with the newest jetpack the problem is back. jetpack is not working with antispam bee on my side. This is a good first cut at integrating multi-platform commenter identities, but as a commenting tool in general, it comes up a little short. Jetpack Comments doesn’t appear to have any live preview function, nor does it work and play well with the few live comment plugins that are extant. Looking forward to future developments, though. For me it seems to be working when I’m logged in. But when I log out or use another browser to check the site, it’s not working. The old comment system is showing instead. Are you using a cache plugin of any kind? Nice plugin. But all other plugins that worked on the text area (like smilies, wysiwyg comment bars etc) don’t work over the new text area. I supose it is due to the iframe. You are correct, plugins that affect the comment area will not work as Jetpack replaces that form with one that is embedded via an iframe. Perhaps if everything but the text ares is included in an iframe? Lets see. It is only the first version. Anyway, good work! to get rid of the normal WordPress greeting text but that doesn’t seem to work in combination with the Jetpack plugin. You could try a non-breaking space, like . The anti-spam tool Antispam Bee is not compatible with Jetpack Comments. It produces the error “Invalid security token”, does anyone know a anti-spam tool which works with Jetpack Comments? The best one IMHO is probably AVH First Defense Against Spam. It checks a couple of realtime blacklists and has configurable whitelists/blacklists. Doesn’t work with the elegantthemes themes either. Painful. Now looking for a fix or I’ll just switch off jetpack. again. Typically, this is caused by a lack or customized use of comment_form(). If you could look at how your theme implements comment_form(), that may help us resolve this issue. Thanks! How do you CHECK that, Tim? You’d need to look at your theme files, either in the Appearance -> Editor menu or via FTP and a text editor. We are in the process of looking at these issues, as well. We’ll update as soon as we find something. See if there’s a comments.php in your theme. That’s where comment_form() is usually going to be. Few quick questions. Is there any way to use the feed burner subscription check mark with this (like I currently use?) I also have a gravatar reminder under my current email box. Any way to add that? Is there any way to make the social log in icons larger? And can I change the “leave a reply” wording to something else? Thanks so much! Is there any way to use the feed burner subscription check mark with this (like I currently use?) I also have a gravatar reminder under my current email box. Any way to add that? Not currently, since Jetpack Comments uses an iFrame. That typically makes the comment form inaccessible to plugins. Is there any way to make the social log in icons larger? No, these can not be customized. And can I change the “leave a reply” wording to something else? Yes, look under Settings -> Discussion. There are some options there for Jetpack Comments. Whenever I enable the new Comments feature, my “Post Comment” button just stops working. You type whatever you want to comment on (while logged in with my WordPress account).. and click the “Post Comment” button..aaaand nothing happens. No loading, nada. I also don’t see the three social network icons to the bottom right of the comment box. Is that important? The “OpenID” plugin for comments directly conflicts with this plugin, as I have discovered after extensive testing over last night and this morning. I got Jetpack Comments working now, hoooray! Nice new features by the WP Jetpack! Good addition! But I miss ‘ALSO POST TO FACEBOOK’ like there is on this comment form: http://www.rbestories.org/2012/06/welcome/#respond if you choose posting with your FB or Tw account. There’s always a possibility for a future update! Thanks for the feedback. friendly comments system like LiveFyre or new DIsqus 2012 etc? Jetpack Comments should not detract from SEO. All comments are still stored locally and displayed by your theme, so there is no change. Jetpack Comments only changes the comment box. I’m having a bit of an issue with the spacing of Jetpack comments. http://huntermastery.com/reviews/wow-secrets-truth-scam.html as you can see at the bottom just under the Leave a Reply there is this massive box that drops just under it. When you click to reply it fill this pace some what. How to I remove this space? The space is there even if I remove all my CSS, which I’ve done and tested. I upload a blank styles.css file and the space was still there. I thought maybe it was an theme issue, so I tested that, changing to the default them, space was still there. Maybe it’s plugin, so I disabled every plugin but Jetpack and the issue is still there. Looking at this page, there is a very small space between the comment box and it opens up pushing the footer down when you click inside of it. So how do I fix this? It really makes my layout look horrible, I’m running the latest version of WordPress, all my plugins are up-to-date. I just don’t get it, even if I try to control the height of the iframe, making it small doesn’t help, the space at the bottom is still there. Having a small problem with this plug in. After activating jetpack comments, I decided that my current Facebook integration solution better fit my site. After I deactivated jetpack comments, the comment iframe was still showing instead of my normal contact form. I tried reactivating it, deactivating it. Deactivating the entire jetpack plugin and reactivating it… no change… well.. slight change… now the box is all greyed out and says… “invalid request signature”. Oh, and yes… I cleared my cache every step of the way. I see the standard WordPress comment form on your example page. Are you using a cache plugin? Did you clear that and your browser’s cache? Weeeeeeeellllllll shoot…. I don’t know what in the internetz happened but your right… It’s fixed now. I do have a cache plugin and was clearing that and my browsers cache over and over… Even went to a different computer…. Hmmm… Oh well. Guess its just gonna go down in history as one of the great unknown mysteries of the universe… Like where babies come from! Update; I think I figure it out why there is the space at the bottom, that’s the iframe which has a set height of like 315 for login users and 400 something for none. I’m not sure why it doesn’t close all the way. I looked at a few other sites running Jetpack Comments and noticed that the iframe height set in the code itself is 91px when closed, and then to 435 when you open it. Doing some digging on how to control the iframe height, that this is a script call doing it, and testing it on my two wordpress installs (on two different host) I learned that the code is there but it’s not working, my guess is that maybe because I’m on a Network install? I’m going to test installing a none mutiesite wordpress and see if it works there. If it does then why doesn’t it work with wordpress running as a network? First, awesome! I’m glad to finally see this, I’ve been a big proponent of this getting made available through jetpack. I’ll continue to check it put, mine are just initial impressions, still as I said up top, super excited have it as an option. I’d love to see AWeber integration. I was able to add a custom “Subscribe” checkbox for my email list before, and I’d like to include that sooner than later once again. That said, this is fixing my one big problem — letting users leave comments from their social profiles! I checked and it works with the “What Would Seth Godin Do” plugin, which is my biggest must-have for commenting at the moment. Three items to make it better. One is to allow the site owner to default it posting the comment and linkback to their FB or Twitter account. Two is to set an option to put the comment box at the top of the comments. On a page like this or like many of ours that have 500+ comments scrolling to the bottom to comment is frustrating. Three is to set it up to load comments in batches of about 50. That way the page doesn’t take 2 minutes to load when there are 500 comments. This needs support for open id and perhaps Disqus. On my site (www.spinecomic.com) the avatars don’t show up, if someone logs in and comments. Also, the “log out” option isn’t there either. But the comments show up with the proper login with social media options. What could be causing this? Any thoughts? I haven’t heard of that — probably best to contact support and see if they can help you. Does this remove all existing comments the way facebook comments does? I hope not. No, Jetpack Comments only effects the comment form. Comments themselves are still stored as normal WordPress comments and displayed by your theme. This has shown up for me, and I have enabled it, but it is not showing up. I still have the same old comment form. I’m not sure what I should do to get it to show up. Any ideas? Sorry that comment is completely unclear, I am half asleep. JP Comments has appeared in my dashboard. I have enabled them, but the new form is not showing up on my website and I’m at a loss as to what else to do to get it working. That’s probably because your theme doesn’t use WP’s comment_form() API — could you try it with a different theme? Thanks. I found this out right after leaving the comment. I have contacted my theme providers about adding compatibility. Thanks again! I am still seeing the default commenting system. I am calling comment_template() in single.php and have no caching plugins installed at the moment. Scratch that, comments_form() wasn’t working…I wonder why? DOH! Anyway, I have JP social media commenting working, but I have the same trouble that everyone else seems to be having with the space below the comment box. We’re working on a fix for this. We should have it ready soon. Thanks! The icons to login for facebook and twitter have disappeared but when i point on the section where they were…..the link to do so it still there…..how can i bring back these icons? please help. This should be fixed now. There was a temporary glitch on our end where those images are hosted. We took care of that and the images should be available again. Thanks! I’m loving the new functionality of the new Jetpack comments, but it’s really annoying that I can’t customise the appearance at all with CSS, what with it being in an iframe. It can make it sticks out like a sore thumb on heavily customised themes. Hope you’ll be able to add the ability to add custom CSS in an update soon! Custom CSS is not likely to be an option in the near future, though we do have some updates on our roadmap to make Jetpack Comments smarter about how it picks its theme colors. Thanks for the feedback! I can’t for the life of me figure out how to edit my php to get this plugin to work. I know I at least need to add the line “comment_form();” somewhere and I need to delete some lines somewhere. But the php is just too confusing for me. I can’t get the form to appear at all, and the whole background of the site turns from white to gray when I start messing with the code. They allow you to post to facebook profile, and the comment form looks like facebook form. But on the blog the submitted comment appears the way your native comments look (which at this point would be the jetpack look). I hope Jetpack comments is compatible with that. It should be in your theme’s comments.php file, though you should talk to the theme developer to be sure. Also, the Facebook AWD plugins are not compatible with Jetpack Comments. Both of them try to use the comment_form() filter and, due to that, only one will work. See – if we could set our own questions/answers we will get 99% of spam gone before Akismet and not much to check for ‘false positiv’ in trash. Have tested several addons trying to get captcha. Reason is, yes Akismet do take almost all spam, but whats the use of that, when i need to go in trash and look for ‘false positiv’ anyway. When you get like 50-100 spam a day you easy can stop with a question, i dont see reason for not implement it. can you add spell checking to the comment form? 2) you could add a tweet this comment. 2) Thanks for the feedback. We are considering social options for comments, though there is no ETA on when these will be released. Try disabling other plugins and see if there is some interference. If that doesn’t help, please email us at support@jetpack.me with a link to this comment and we’ll investigate further. Hi Tim. Thanks friend. I have done that. And emailed support. Deactivation made no difference. hey there, good stuff here. i’m currently using subscribe to comments and currently have 500-600 comment subscribers. would all those go away if i enabled this jetpack comments?? Yes, if you use Jetpack Comments, it would interfere with your Subscribe to Comments plugin since Jetpack Comments loads via an iFrame. thanks tim! do you know of a way to migrate from subscribe to comments to jetpack comments? just don’t want to lose all my current comment subscribers. I’ve been trying to get the Comments part to work properly on jeanhopkins.com, but the iFrame keeps redirecting to wp-comments-post.php?for=jetpack with a “Page Not Found” after logging in and posting a comment. I’ve tried re-authenticating the blog with Jetpack in case that was the issue, however it still refuses to post comments. Take o look at your WordPress files and make sure that wp-comments-post.php, as a file, exists. It might be that this was deleted or otherwise removed at some point. The file exists and I set the permissions for executable-by-server. This was one of the first steps I verified. I even tried uploading a new version. When I visit /wp-comment-post.php on your site, I get a blank white screen. If it were working properly and I visited it in a browser, it should send me to your site’s 404 page. Either you have a plugin that is blocking that file or your host is blocking it in some fashion. I got a “Page not found” when going to jeanhopkins.com/wp-comment-post.php. Not sure why you see a blank white page. I’m using Chrome, and I’m logged in on my blog. I just tried logging out and got the same “Page not found” “this is embarassing” text. Standard WordPress 404. Jean, I sent you an email. Please check and respond there so that we can get this sorted out. Thanks! Does Jetpack Comments works on no follow ? I am not sure what you mean. Can you explain further? Sorry, but there was an error posting your comment. Please try again later. i’ve been trying over 5 different way to fix still i am not able to put comment under photos. is anyone know how to fix this problem ? Please contact us at support@jetpack.me with a detailed description of the issue, a screenshot, and the site URL.